Mahour Jabbari in director Sadaf Foroughi’s feature film, “Ava.” Photo by Shahin Azma. Courtesy of Sweet Delight Pictures and Grasshopper Film. Writer-director Sadaf Foroughi’s “Ava” is an engrossing story about a teenager’s coming-of-age experience in Iran. Bound by the ultra-conservative social norms and pressured by a controlling mother, Ava is driven to a rebellious streak striving to assert independence and a sense of self. To say “Ava” depicts the struggles of a teenager is only half the story. With “Ava”, Foroughi also explores the tall order of parenting and maintaining family relationships between couples and parents with their children, a challenge not just for the repressive society of Iran but everywhere. Despite the differences in societal values, there are overlapping similarities in the heart of adolescence across cultures. Surely there are extreme measures of parental control which is beyond our imagination–such as when Ava’s mother takes her to a gynecologist to check if she is still a virgin after finding out she is seeing a boy–the film also reveals how Ava’s longings and struggles may be found among the young of our Western society. These relatable commonalities are what draw us into the story readily and elicit our empathy. Born in Tehran, Foroughi based her film on her own adolescent experiences growing up in Iran. She later studied French literature and eventually earning a PhD in film philosophy from the University of Provence. “Ava” is her directorial debut feature. It shows the director’s intelligent handling of meaning and conflicts from an aesthetical, cinematic frame. “Ava” won the 2017 International Critics’ Award (FIPRESCI) at TIFF and the Best First Feature Film at the Canadian Screen Awards in 2018. It is currently a selection in the Contemporary World Cinema Program in the 44th Seattle International Film Festival May 17 – June 10. Ava is a model student and loves to play the violin. She wants to major in music in college. Her mother, a medical doctor in a hospital, thinks music is not a serious career path and tries to block her pursuit. Just from this, we know the conservative society allows room for women to achieve higher education and professions as career choices are possible. It is just that Ava has to deal with a ‘tiger mom’. She is already being made fun of in school due to her overprotective mother. Conversely, Ava’s father values creativity and respects Ava’s passion of music and freedom of choice, but he is frequently away for his work. So, under one roof, there is a split in parenting style. Ava tiptoes around her parents, eavesdropping on their conversations and arguments while quietly planning her own scheme to win a bet she has made with her classmate, that is to get a boy she admires to go out with her, a normal teenager’s desire for excitement and autonomy. While the story is riveting, it is the cinematography that distinguishes Foroughi as an exquisite visual storyteller. One can readily observe and appreciate her metaphors. From an overhead shot of the all-girls’ school as the students line up to start the day, it is a sea of black, for every student wears the traditional black headdress, their clothing all dark grey or black. Foroughi leads us to follow Ava by her red backpack, and later we see she wears red sports sneakers. After school, to win her bet, her best friend Melody prepares her as she heads out to see the boy. Ditching the black headcover, she wears a red headscarf, and lets Melody apply red lipstick on her. Ava is a teenager after all. The red is a stark contrast to the prevailing black of her social environs, a distinguished mark of youthful vibrancy and individuality. But Ava is not a happy teenager. Her overprotective mother taking her to the doctor to have her virginity checked is the inciting downward turn of their relationship. Often the Interior shots of Ava’s home are from the perspective of looking into a room. The screen is framed by darkened walls as only the open view into the room is lighted. The claustrophobic feel could well represent Ava’s internal state of mind. The play of light and dark splitting the screen is aesthetically stylish and carry deeper meaning of intrigues and secrets especially when the conversations are off-screen. The camera often captures the image of Ava and other characters as reflected in a mirror. The duality of personhood in a repressive society could be the implication. And then there are times when the actual characters are blurred but the focus is on their image in a nearby mirror. It is from reflections that the true self be known, the internal exposed, or, as in a pivotal scene, when secrets are revealed. The open-ended last shot is poignant as Ava looks right into the camera. What would she do? 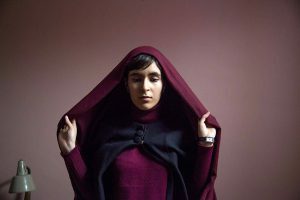 Fortunately, we know what had become of the girl growing up in Tehran, she is now a promising filmmaker in Canada. Director Foroughi will attend the screenings of “Ava” at the 44th Seattle International Film Festival May 23 and 24 and will be on hand for the Q & A session. For details and tickets click here. https://www.siff.net/festival/ava.